Though the name rod is sometimes used interchangeably with stainless steel bars, rods most often have a circular cross-section whereas bars can be produced in squares, hexagons, octagons or flats. Like bars and other stock shapes, stainless steel rods are occasionally used as the end product, but more commonly are sold to manufacturers who then rework the material into the desired part or component. Melting, pressing and rolling are commonly used to yield the desired components for variable applications across the industrial sector. The anticorrosive and hygienic properties of stainless steel make these rods popular as such varied items as automotive parts, medical tools and prosthetics, marine paneling and more. Though some other stock forms such as stainless steel sheets and plates may in some applications be closer to the finished product rods are often preferred for their uniformity which makes consumerism, shipping and processing predictable and efficient. It is important to consider the specific dimensions of stainless steel rod including, but not limited to outer diameter, overall length and weight as well as the impact of production processes and various performance features. Though corrosion and wear resistance are common to all stainless steel products, the specific properties of a given rod can vary considerably based on the grade of metal alloy used in its production. Stainless steel is the name given to a large group of iron ore alloys. While small amounts of carbon, nickel, molybdenum, silicone and aluminum are present in various combinations, the essential element found in stainless steel alloys is minimum 10% chromium content. The chromium in the steel forms a “passivation” layer of chromium oxide on the surface of the stainless steel rod or other stainless product. The chromium oxide is self healing through minor scratches and acts as a protective layer against staining, wear and corrosion. Many other properties of stainless steel are shared with other grades of steel including tensile strength, high ductility, strength to weight ratio, impact and heat resistance, longevity and hardness. The workability is also an important aspect of stainless steel rods as it results in their potential to be used in countless applications. To begin with though, the iron ore alloy is heated in electric arc furnaces until it reaches the point of re-crystallization allowing the mixture to homogenize. The molten material is then cast into semi-finished billets which are formed into finished rods and cooled. Alternatively rods can be created through die casting billets and ingots through progressively smaller dies until the desired diameter is reached. 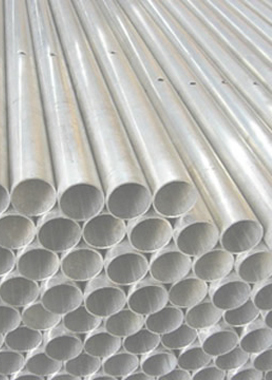 Stainless Steel Rods Stainless steel rods are solid cylinders of a group of steel alloys known for their impressive resistance to wear and corrosion even in harsh environments.